A Nissan GT-R patrol car is now on duty in Japan. 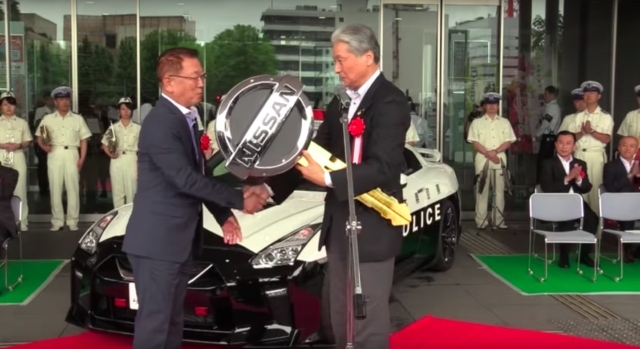 At a ceremony today, the country’s fastest pursuit vehicle was donated by Nissan to the Tochigi Prefectural police department. The gift marked 50 years of operations of Nissan’s Kaminokawa, Tochigi factory, where GT-R is built. 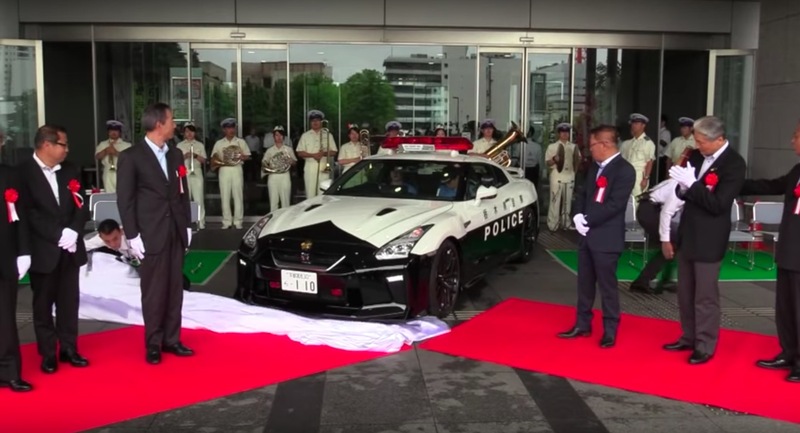 “The members of the patrol unit were excited to hear that the GT-R is joining the fleet,” said Masaki Tanaka, commander of the expressway patrol unit. Ya think? The ceremony included the exchange of a comically large key, which is doubly funny since the GT-R no longer uses a physical key to unlock or start the car. What is it with mayors and giant keys? 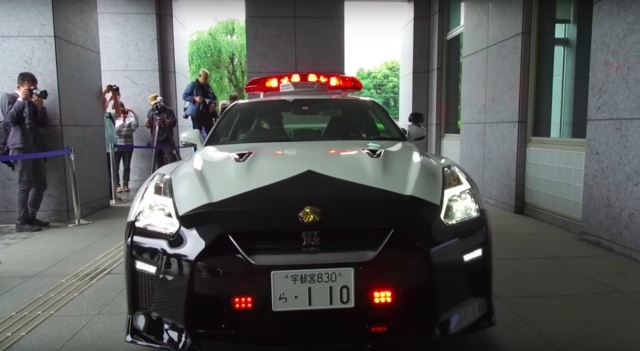 This is the first time a GT-R has been converted to a police car in Japan. It appears to be the non-NISMO version, so “only” 565 law-enforcement horsepower lies under the hood. Externally, the car adds a light bar, siren and beacons in the grille. The white-on-black paint job looks sinisterly cool with with with its black 20-inch Rays. Lit up, this is the new face of terror in your rear view mirror if you happen to be speeding through Tochigi. Nissan says that in addition to gobbling up miscreants, police Godzilla will also be used in promotion to get kids interested in cars. 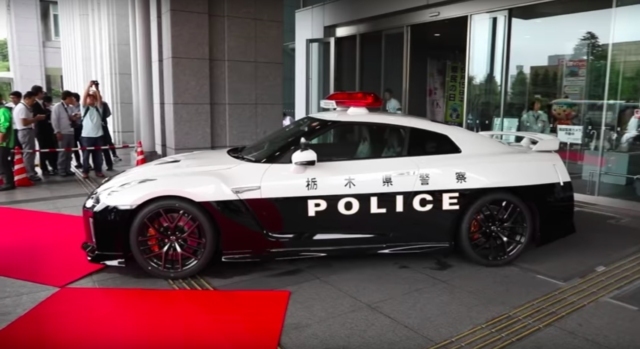 Of course, this isn’t the first time a high-performance car has been used as a police vehicle in Japan. The Bubble Era routinely saw cars like the Nissan Skyline GT-R R34, Honda NSX, Toyota Soarer, Mazda RX-7 and Mitsubishi 3000GT dressed in black-and-white uniforms. It’s good to see Japan up to its old tricks again. Thanks to Masahiro K. for the tip! tagged: gt-r, nissan, police car, r35. They could use a few of those here in SoCal, where 80mph is the norm. Not necessary. They just block streets and deploy helicopters at car meets here. Ref tickets for everyone. On a side note: It would’ve been much funnier if they gave the mayor a giant finger for the push-start instead of a key. Damn, it’s missing the rad clear plastic bug deflector that Japanese highway police cars used to have on the hood. All of the older cars you mentioned had them, I’m disappointed. The police NSX never had one. I doubt they want to drill into the hood of such a nice car just for a clear protective shield. Oh, right, the NSX didn’t have one. I don’t think it’s because of that, though, as they had no problem drilling into the hoods of the Skyline GT-Rs, RX-7s, RX-8s, GTOs and Supras. Even some of the Imprezas had them, completely blocking the huge scoops! I think the shields look really, really cool and I’m kind of thinking of making one for my car. Or to steal from Ford “Police Interceptor Special”. They got nothing on my drawing of a shakotan cop car I did in art class in High school. a picture inspired way too much by what I was reading here on the JNC website. Donut squad be boostin on dubs in Tochigi. There is still a R34 GT-R Pato Car roaming somewhere in Japan. Last time I was there, I saw a dark grey wingless unmarked STI with all the police gear inside and a bubble light. It makes me wonder if Japan still has high performance speed enforcement cars, they just don’t advertise it as much as they used to. The thing that always amazes me is the unmarked ones with the light that flips out of a specially-cut hatch in the roof (but why not make that a modular panel that’d fit in the open hole of a factory-sunroof car so somebody in Auckland or Vladivostok doesn’t have to figure out a post-cop use for it? Or better yet, just run the cars so equipped 20-25 years until used up).